"'Fishing in Preserved Waters' (J. H. Gear, London - Silver Medal). A capital and original idea, thoughtfully worked out. The work of this competitor has become tolerably familiar to the frequenters of photographic exhibitions during the past year, but we do not remember having seen any picture from him which we like better. The picture is admirably composed, and extremely effective. 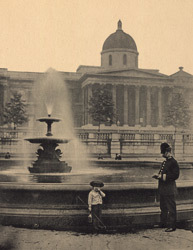 It would probably occur to but few amateurs that opportunities for successful picture-making were to be found in the very prosaic surroundings of Trafalgar Square. Mr. Gear believes in working large-size plates direct, for the original negative was taken with a Taylor & Hobson lens, working at f/16 upon a 12 x 10 plate at 7 a.m., permission having first been obtained from the authorities to use the camera in the Square."